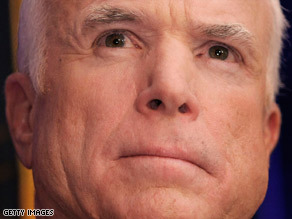 Sen. John McCain says Congress has put the economy "at the gravest risk"
WASHINGTON (CNN) -- The House's failure to pass a $700 billion bailout package Monday not only held back billions for Wall Street but also was a major blow to Sen. John McCain's presidential campaign. Sen. John McCain says he is ready to work to get a financial rescue plan through Congress. "Even before the House vote, voters blamed Republicans more than Democrats for the crisis. Then McCain suspended his campaign to come back to Washington to rally support for a rescue plan," said Bill Schneider, a CNN political analyst. "He failed, so he gets blamed by both supporters and opponents of the rescue plan." During a campaign event in Des Moines, Iowa, on Tuesday, McCain appeared to distance himself from Monday's House vote, saying the congressional inaction had "every American and the entire economy at the gravest risk." "Yesterday, the country and the world looked to Washington for leadership, and Congress once again came up empty-handed," he said. But over the weekend, McCain had involved himself in the efforts to get the bailout package to the president's desk. iReport: Do you support the bailout? "He has been making calls to members in support of this bill ... and I'm grateful for his support," Boehner said. iReport.com: Do you support the bailout? After the vote, McCain was defensive, accusing his Democratic rival, Sen. Barack Obama, of just wanting to "phone it in" when it came to the bailout and introducing partisanship into the process. But on Tuesday morning, McCain said the bill failed "because we haven't convinced people that this is a rescue effort, not just for Wall Street, but for Main Street America, for working families, for small businesses, for the heartland of America." Before the House vote, McCain was losing ground to Obama because of the increasingly bad economic news. A CNN/Opinion Research Corporation poll conducted September 19-21 found that Obama was leading McCain 51 percent to 46 percent. Earlier, after the Republican convention, the two had been tied in the polls. And the CNN poll found that Obama leads McCain 49 percent to 43 percent among those surveyed when asked who had showed better judgment in the economic crisis. Terry Jeffries, a Republican strategist and CNN contributor, also said McCain may have hurt himself among conservatives by losing sight of his party's free-market principles. "I think that John McCain failed to lead," Jeffries said. "He should be right there pushing the principles, and the conservatives in the House are doing that right now." "He didn't put himself in that process. He was smart enough to realize he couldn't control the House Republicans or Democrats," said Ed Rollins, another Republican strategist and CNN contributor. But McCain's allies still said the Arizona senator made the right move when he inserted himself into the talks. "He wanted to come back to Washington and to help with the crisis. And the fact it didn't work out, it's not on his shoulders," said Ron Bonjean, a Republican strategist. "Frankly, it's on the Democrats' shoulders. They're the ones who run Congress." CNN's Ed Henry and Scott J. Anderson contributed to this report.